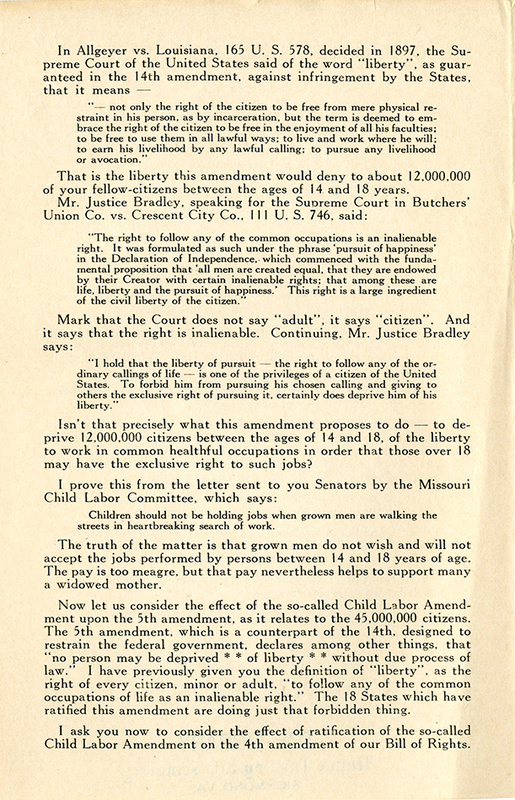 Materials sent to pastors in the Presbyterian Church in the United States (PCUS), urging them to contact their state representatives to oppose ratification of the Child Labor Amendment, which was adopted by Congress in 1924. Included are a note from Rev. 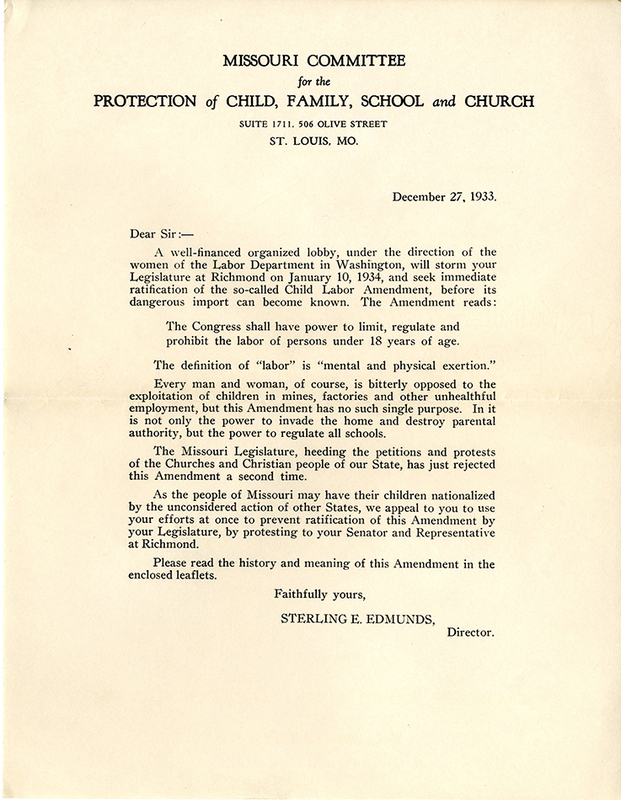 William Crowe of the Westminster Presbyterian Church in Saint Louis, Mo; a letter from Sterling E. Edmunds, Director of the Missouri Committee for the Protection of Child, Family, School and Church; and a pamphlet produced by the Sentinels of the Republic containing an address titled, "Some Constitutional Aspects of the Child Labor Amendment" by Sterling E. Edmunds. 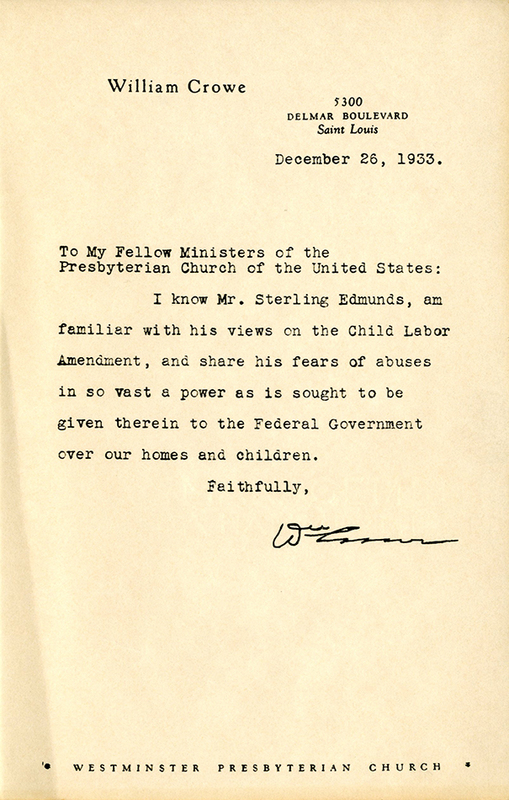 A well-financed organized lobby, under the direction of the women of the Labor Department in Washington, will storm your Legislature at Richmond on January 10, 1934, and seek immediate ratification of the so-called Child Labor Amendment, before its dangerous import can become known." 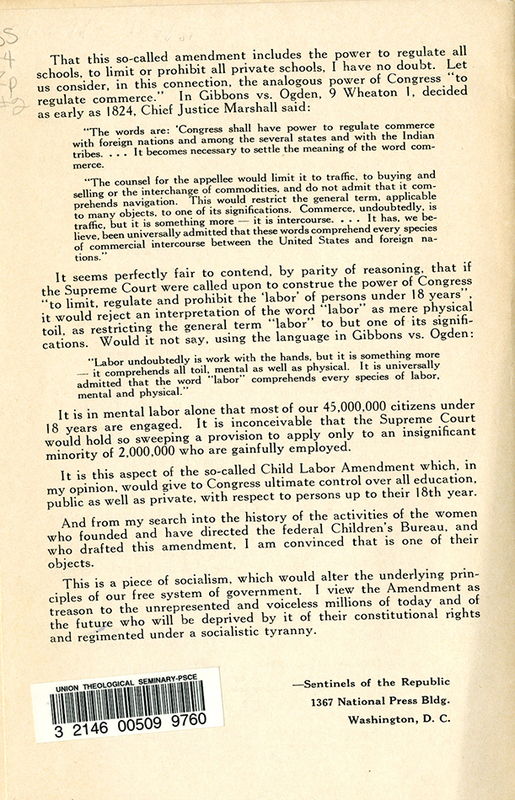 In the pamphlet, Edmunds argues that term "labor" in the amendment also refers to mental labor such as takes place by students in school. He states that the Child Labor Amendment would therefore allow Congress to take control of all public and private schools. This, he claims, is socialism. The Sentinels of the Republic was a national organization that opposed what it saw as federal encroachment on the rights of the States and of the individual. The group was highly active in the 1920s and 1930s, during which it worked against child labor legislation and the New Deal. The Child Labor Amendment is a proposed amendment to the U.S. Constitution that was adopted by the U.S. House of Representatives and the U.S. Senate in 1924, but never ratified by the required number of U.S. state legislatures. 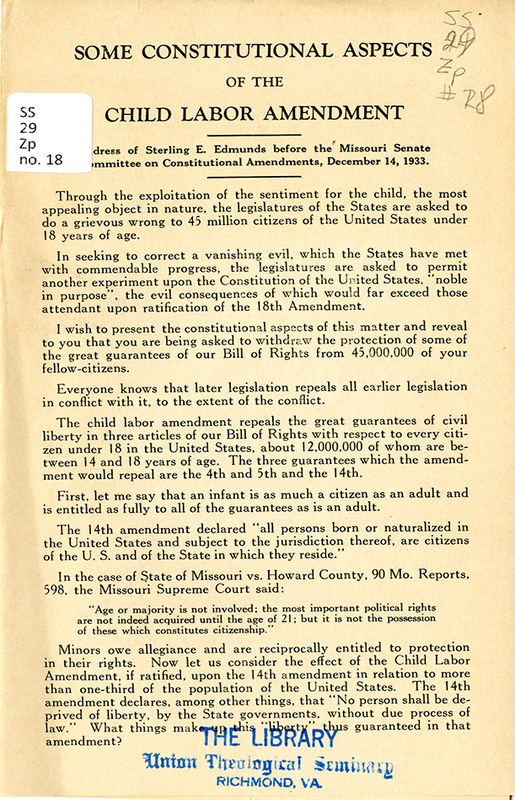 Pamphlet p. 4 "It is this aspect of the so-called Child Labor Amendment which, in my opinion, would give to Congress ultimate control over all education, public as well as private, with respect to persons up to their 18th year. And from my search into the history of the activities of the women who founded and have directed the federal Children's Bureau, and who drafted this amendment, I am convinced that is one of their objects. This is a piece of socialism, which would alter the underlying principles of our free system of government. I view the Amendment as treason to the unrepresented and voiceless millions of today and of the future who will be deprived by it of their constitutional rights and regimented under a socialistic tyranny." 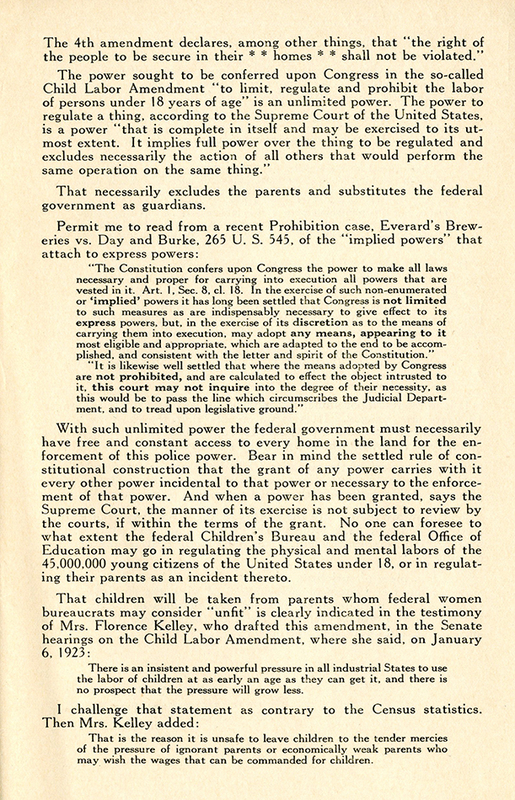 Edmunds, Sterling E., 1880-1944 Crowe, William , “Some Constitutional Aspects of the Child Labor Amendment [Anti- Child Labor Amendment materials],” Social Welfare History Image Portal, accessed April 26, 2019, https://images.socialwelfare.library.vcu.edu/items/show/320.